More than 1 billion people of diverse cultures, languages and religions are united by India's national borders. Between 2010 and 2011, the country's census will not only count and categorize them by gender, religion and occupation, but also probe their access to technology, toilets and personal transport. In a monumental orchestration, aided by a newly designed census form, government departments, local councils and 2.5 million census collectors will continue the increasingly complex national effort to tally India’s inhabitants, which it has conducted every decade since the late 1800s. Indian states and districts are well aware of the importance of census numbers to ensure their future funding and so are willing to promote the effort. Local governing bodies have publicized the census through events such as street theater, school debates, folk music and cycle rallies. For the first time, some 15,000 exiled Tibetans, including the Dalai Lama, are being documented. With challenges posed by linguistic variation and literacy levels, the census collectors play a vital role. Officially known as enumerators but unofficially as census-wallas, they record all responses on forms that are later collected, scanned and read via character recognition software. But the complexity runs deeper than that: The forms must be printed in 16 different languages, and many people have hazy recollections of their birth years while others adhere to religious calendars that run on lunar cycles. The extensive enumerator manual provides assistance by listing local dates of interest to prompt memory of known events in relation to birth years and by correlating divergent religious calendars. The manual also encourages enumerators to be gender-sensitive and explains how to record details like polygamous marriage. The census forms were designed by Rupesh Vyas, a member of the information design faculty of Ahmedabad’s National Institute of Design. “We started the exercise with a user-study which raised contextual issues such as the possibility of low light and cramped conditions,” he noted. Such observations informed suggestions like including a backing board to stabilize the forms as enumerators took notes. Creating a form template that could support 16 different languages was an additional challenge. While Frutiger was selected for the English version, the designers had to rely on a limited font selection for the other languages, and southern scripts for Tamil, Malayalam and Telugu demanded more space. “Judicious use of real estate was required across the form, reducing redundancy and economizing information while allowing for explicit enumerator instructions,” Vyas said. According to Vyas, the previous forms had little sense of hierarchy, alignment and consideration of proximity between instructions and relevant areas to be filled out. The constraints of intelligent character recognition (ICR) software were also factored into his designs. The paper used for forms had to exceed 80 grams per square meter for optimal ICR performance, with the total amount of paper used for the nation’s forms exceeding 12,000 metric tons. Barcodes have been employed to provide specific location details, acknowledging the comprehensive nature of both dispatch and collection in a design that has considered users' needs alongside system-wide issues. “Prior to digital recognition technology, the census results could take six years to come out. Now we can reduce this to a mere six months, ” Vyas said. A senior census official in Delhi was generous in his praise of Vyas’s dedication to detail. “This is such a far-reaching improvement. Visibility and clarity have been enhanced significantly but also this year’s forms are something that give census enumerators a great sense of pride.” Vyas’s faculty colleague Praveen Nahar recalls childhood memories of his own father's involvement as a census enumerator. "The questionnaire format has come a long way since then and is certainly more user-centric. It's a shining example," he adds with designer-ly wit, "that forms follow function." It would have been nice if you had provided a link to the actual form. Language problems aside, the design aspects should be obvious. I'm going to forward it to Raj Mashruwala, who leads Nandan Nilekani (a classmate and former colleague of mine from Patni)'s MNID project. (India's Social Security Number). Great post, design affects and contribute in every aspect of live. But I agree with Charles, a link could be useful and interesting. @Charles: Agreed – showing part of the forms within the article would have been relevant but we were keen to respect the wises of both the designer and the Indian national registry on this. However you can follow links via the Census India site provided by Praveen above which will take you PDFs of the enumerator manuals: http://bit.ly/awYCrt (not designed by Vyas) Sections of his English forms from the recent census phase appear on pp 67-68 of the INSTRUCTION MANUAL FOR Houselisting & HOUSING CENSUS. Other languages follow on consecutive links. This is very interesting, I would love to know more about how they plan to address the millions of people living in the slums. They may count every household, but there is an astonishing number of people in India living in tents and shelters from whatever materials they can find. I hope as India retrieves this data they ensure that the people this data most needs to reflect are counted. I would worry that the government may try to avoid this simply to make the nation appear as a shiny new power nation to the rest of the world when in fact they still have a long way to go. @Megan: pavement dwellers are to be counted in the second phase of the census in early 2011. It's an intensive exercise which will happen over one night across the nation to avoid double-ups. I have spoken to some of my informants from last year's research at Mumbai's Dharavi slums who have already been visited by census enumerators as they live with some kind of roof over their heads. Such households were accounted for in the first phase of census collection. Meena, an extremely informative piece. As an ex advertising creative person I completely understand the need for extra space that Indian languages need to say the same vis-a-vis English. I was wondering if you do a similar on your blog but in a lighter vein :) Because it can get quite entertaining when a nation as large as ours decides to do a headcount. nice piece. fascinating complexity. 2.5 million census collectors! staggering. I too would like to see a link to the form to get a better sense of the spacial economy. But otherwise keep up the good work. Thoroughly enjoyed this. Interesting and impressive exercise in view of the difficulties some Western countries have even managing their elections to ensure everyone gets a vote!! I still can't find the right thing at Praveen's link, though. I still really want to actually see the form. @Kari I just checked and notice that the PDFs which featured the forms that were on the link earlier this week have been removed. Sorry – we don't have any control over what happens on the Indian census site. @Kari But seems they're back up again now. Try the second PDF on Praveen's link page and go to page 67. 2. We had guests over our place and thats why decided to give out information near our entrance door/space..Later we figured that even our neighbor had decided to do the same! 3. While they were standing, questioning and filling the details, it became really hard for them to manage and hold the board! One has to sit to fill in the details!! It took 20 min. approx. to give all the details. Surprisingly, they were taken aback when they realized that my wife hadn't changed her last name to my/husband's last name. I think they didn't have any provision for that. We debated over this for a while and moved to the next question. Wonder what information they must have stored..
4. We offered them water and they moved to the next door.. I had alot of questions to ask, but couldn't.. I wonder how many houses they do per day? What kind of people do they meet? Do people invite them inside their houses? How is this data stored ? A tablet would have made their lives simpler ? Storing data and synced in real-time with the central DB ? Every house can then be geo-tagged? 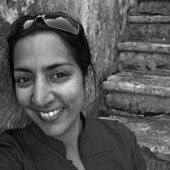 Just a random thought..
New Zealand–born Meena Kadri explores the intersection of communication, culture and creativity from her consultancy Random Specific. Meena is currently a Community Manager on OpenIDEO. It started quite innocently — as most obsessions do. A snap of a painted truck here and spot of rural advertising there, on annual trips to the ancestral homeland. Report on Conflict Kitchen, a project by artists affiliated with Carnegie Mellon to foster cross-cultural understanding through food. Interview with Emeka Okafor, founder of Maker Faire Africa.